How many Units (240 Tablets)? "Secrets Every Multivitamin User Should Know"
If you're currently taking or considering taking a multivitamin with a recommended serving size of only one pill a day, you're pretty much wasting your time. It's very doubtful that any single pill can pack enough vitamins and minerals to truly make any real difference in complementing your healthy diet. Producers of multivitamins have come up with some pretty amazing ways to compress natural nutrients, but not to this extreme… not down to where a single tablet provides you the vitamin and mineral levels you need. And speaking of minerals, many producers of one-a-days don't even bother including essential minerals like potassium or magnesium, or even calcium in adequate enough amounts to really make a difference. What about other nutrients from natural sources like vegetables, fruits, and herbs? Shouldn't they be blended into your multi as well? I certainly think so. But it's also vitally important to know when to take your multivitamin.You should take a few multi tablets first thing in the morning and with lunch, or with an early dinner to help optimize your nutrient absorption, the better chance you'll have of truly fortifying your diet. Before we jump further into all the natural nutrients I believe should go into a multi, let's first take a closer look at why all multivitamins are not created equal. Some may in fact, negatively impact your health in such a way they should be flushed down the toilet. In my opinion, if you shop for your supplements at discount stores you may be seriously shortchanging yourself because those products typically use cheap synthetic isolates. Millions gorge themselves on synthetic vitamins, only to acquire and die from degenerative diseases. You see, isolated vitamins are partial vitamins, combined with other chemicals. They're a low-end alternative to whole, real complete food. When you remove a part from the whole, you get ‘Synthetic,' ‘Isolated,' or ‘Fractionated' pieces of the whole, but it's simply not the same. Nature intended for you to consume food in WHOLE form because all the vitamins, minerals, antioxidants and enzymes are together in one package. They work synergistically to give your body the nutrition it requires for optimal health. Your body only absorbs a small percentage of an isolate form of vitamins and minerals – and it utilizes even less. You get the best bioavailability in whole food form. Synthetic vitamins often give you massive quantities of some nutrients (usually the most inexpensive ones) and insufficient quantities of others, not balance. You can experience side effects of synthetic isolates from the additives and the unnatural state of the synthetic supplement. You've heard me say it before… Fast food and a sedentary lifestyle can be a disaster for your health. Don't let your multivitamin add to the collateral damage. In fact, you want to be sure it makes a real and significant contribution to your health, especially if you've already adopted healthy lifestyle practices. After all, I'm quite sure you're one of the nearly 100% of the human race who wants to feel on top of the world…. All the time. Feel Great All the Time? One thing you can always do to optimize your health and feel great is to maximize your immune system's capabilities. Because face it – everybody wants to feel well all the time, don't they? Now is the time to start moving toward a healthier diet and lifestyle. Start today, by adding just one raw vegetable per day to your diet… a small, do-able step toward your better health. Why Make These Changes Today? Because today is the first day of the rest of your life! Why wait? Ideally it is best to receive all your nutrition from high quality unprocessed foods. Unfortunately, if you're like most people, you may find it impractical or impossible to eat right one hundred percent of the time. Therefore, even when you take the steps of adding raw veggies to your diet and getting some exercise and vitamin D, you still might want to hedge your bets by supplementing with a quality multivitamin every day – just to be sure. What Can a Multivitamin Do for You? Especially if you're already adhering to a smart lifestyle with a healthy diet, exercise, adequate sunshine and good sleep. I received quite a bit of feedback that you wanted an even more comprehensive formula than my original Whole Food Multi. So I went back to the drawing board and worked with my team to come up with an extraordinarily powerful formula -- at a fantastic price. Must AVOID additives or synthetic nutrients -- I only considered natural and whole food-based multivitamins. Must be produced by a highly reputable company with the highest quality control manufacturing practices in place -- I focused on quality as a higher priority than quantity. Must include the added bonus of essential minerals -- Minerals add their unique layer of nutritional support*. 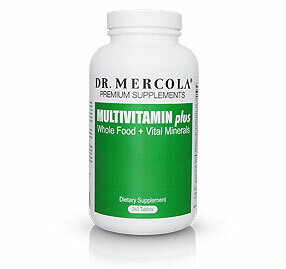 Many high-potency multivitamins with rich vitamin concentrations lack important minerals. Why Not Just Eat All-Natural Whole Foods? As you already know, I've been a proponent of eating whole foods for proper nutrition for years... and now -- eating the proper whole foods based on your Nutritional Type (NT). So, in recommending a high-quality multivitamin, please remember that these nutritional supplements complement the food you eat. They do not take the place of a healthful diet of unprocessed organic foods, which I believe is still the best physical factor for you to achieve optimal nutrition. However, accessing and eating high quality foods regularly may be a personal challenge for you and your family. Your busy schedule may lead you to cook healthy whole food less than you know you should -- and eat "fast food" more. Even if you do well with your diet choices, another factor involves the actual food supply itself. A number of carefully controlled studies have provided startling evidence that by the time the food reaches your table, serious nutrient content could already be lost. Some estimates report the nutrient value lost at over 50%! This is largely the result of conventional farming methods that rely heavily on chemical fertilizers and pesticides, which deplete the soil of nutrients... nutrients that must be absorbed by plants in order to be passed on to you. And it does not necessarily end there. In many cases, it's likely you unknowingly further deplete the nutrients in your food -- just by the way you prepare it. For most food, cooking it will seriously impair its nutritional value. So, realizing that you cannot always obtain the whole unprocessed foods you need -- and knowing how easy it is for valuable nutrients to be destroyed -- you now know why I believe adding a good multivitamin to complement your diet is a sound move. Why Settle For Inferior Quality? There are literally hundreds, if not thousands, of high-potency multivitamins on the market today... but there are only a few great ones out there. If you are convinced of the importance of using a multivitamin, then I would strongly encourage you to do your homework, and make sure a GREAT company produced it. When I first started my investigation, I was absolutely shocked at the low quality demonstrated by so many companies. That's why I spent many long months of hard effort to research and identify what I believe is the absolute best supplement manufacturer in the U.S. today. After much tedious and careful research, I was able to identify an outstanding supplement manufacturer -- one who allowed me to help formulate the best multivitamin possible for you. One of the latest awards received by this lab was the 5-Star Gold Medal of Achievement for several of its supplements. The independent research firm, NutriSearch Corporation, issued this top award to the lab in its Comparative Guide to Nutritional Supplements. Of the over 1500 products evaluated, only 4 laboratories received this top award. This lab is in full compliance with current NSF Good Manufacturing Practices (GMP). NSF International is an independent, not-for-profit organization. This recognized body of audit and inspection is one of the most comprehensive and quality-driven initiatives in the nutrition industry. In addition, to reach its 5-Star rating, the lab had to undergo independent laboratory analysis to verify that what is on the label is in fact in the bottle. If you're wondering how to choose betweenMultivitamin +Plus Vital Minerals and my Whole Foods Multivitamin, let me give you my personal recommendation. If you can afford the small extra investment, take Multivitamin +Plus Vital Minerals! Particularly if you're under excess stress, dealing with any health concerns, or don't eat healthy foods consistently. 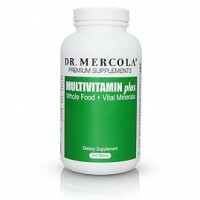 The high-potency formula in Multivitamin +Plus Vital Minerals offers more nutrients, including (but not limited to) calcium, magnesium, and extra B vitamins. It's my ultimate formula, and one I believe you won't find anywhere else. We will continue to provide the high-quality formula found in Whole Foods Multivitamin. If you're currently using a multivitamin or considering another, please do yourself and your family a huge favor. Thoroughly check out the manufacturer and see how they stack up against these rigorous standards. Here's an extensive list of the quality control standards and certifications that this supplement developer and manufacturer has in place today. Keep in mind, some of these standards are voluntary and may not show up when comparing against others. Comply with health and safety measures -- Public Health Security and Bioterrorism Preparedness and Response Act of 2002. You can clearly see why I view this manufacturer so highly -- and why I'm excited to be working with them in delivering an exclusive high-potency multivitamin formula to you. Let's take a closer look at some key nutrients in Multivitamin +Plus Vital Minerals that are often missing from other multivitamins (or found in such low amounts that their effectiveness is highly limited). Remember, one of my top criteria for providing you with the best high-potency multivitamin was that it must contain essential minerals. As I searched for the right formula, I quickly realized that many so-called high-potency multivitamins are seriously lacking in mineral content. Calcium -- To provide a high-level of support for your skeletal system, I chose to include a high amount of calcium in the Multivitamin +Plus Vital Minerals formula*. My main reason for doing this was that, as you age, your need for calcium becomes more and more important to promote healthy bones*.A recent study published in The American Journal of Clinical Nutrition reported that people should consume 741 mg per day of calcium to maintain neutral calcium balance.Realizing the importance of eating as much unprocessed whole food as possible to get the minerals you need, my Multivitamin +Plus Vital Minerals formula provides 250 mg of calcium to complement your healthy diet. Magnesium -- Scientific studies have reported that magnesium is helpful in supporting your lungs and overall pulmonary system*. But some lower-potency multivitamins don't include this ingredient.Other research shows that magnesium intake promotes bone density health. * It also helps maintain your muscular and nervous systems. * And helps support a healthy heart, and your energy needs. *So you can see why magnesium is such a key mineral in my Multivitamin +Plus Vital Minerals formula. Potassium -- This important mineral helps regulate your circulatory system and promotes your heart health. *In addition, research has shown that potassium is another important element in your bone density health. * As you age, bone density becomes an important element in your overall health. *Once again, please realize the importance of eating a healthy diet rich in unprocessed whole foods. Many processed foods lose valuable potassium content prior to ever reaching your table. These minerals may be worth their weight in gold. They provide you with significant health-supporting value in complementing your diet*. They're part of the added bonus that clearly makes Multivitamin +Plus Vital Minerals stand apart from the rest. First of all, I made every effort working with the award-winning lab to ensure that as many nutrients as possible ended up directly linked to their natural source. To me, this became crucial in providing you a top-notch supplement. Multivitamin +Plus's formula has natural value built into it. It provides you with a highly concentrated daily supplement containing more than 50 nutritional ingredients... all in a special herbal food base. One of the challenges your body faces every day is combating free radicals. Free radicals are highly reactive molecules and fragments of molecules that may impact your body at your cellular level. Free radicals constantly attack your body proteins, carbohydrates, fats, and DNA, and can cause potentially serious health concerns unless they are kept in check. Every cell in your body suffers an estimated 10,000 free radical hits each day. Your body does its best to fight back -- in what is an actual battlefield at the cellular level. In addition to the outstanding nutrients already discussed, the Multivitamin +Plus Vital Minerals formula includes a health-promoting blend of vegetables, fruits, herbs, and green foods...from natural sources as far as possible. When this was impractical with certain nutrients, a highly bioavailable form was used to ensure you could take full advantage of these nutrients*. Now you can see for yourself the remarkable ingredients included in the total Multivitamin +Plus Vital Minerals formula. Now, I'll be the first to admit that coming up with my own special high-potency formula was a major challenge -- and took quite a bit of time. This was necessary because indiscriminately throwing a number of nutrients together could actually cause more harm than good. Well, certain amounts and types of nutrients need to be carefully measured to avoid any potential toxic buildup once they are consumed. The bottom line... not all nutrients in certain amounts work all that well together. In fact, a sort of competition can occur between some nutrients. So, much attention was directed to prevent this from occurring in Multivitamin +Plus Vital Minerals. Remember, don't be fooled by the nutrient amounts, or an unusually low cost (could mean synthetic nutrients used), or RDA (required daily allowance) claims by the manufacturer. This information may be totally misleading. You could be not only wasting your time and hard-earned money, but not taking proper control of your health as well. By now, you should be as convinced as I am that Multivitamin +Plus Vital Minerals is the best high-potency multivitamin available today. Not only is Multivitamin +Plus Vital Minerals rich in balanced vitamins and essential minerals, the manufacturer that produces it adheres to the strictest quality standards. This is a winning combination like no other I've seen. If you're currently using a high-potency multivitamin or considering another, please promise me that you will at least carefully analyze the supplement manufacturer. Remember, I am always striving to produce the best possible products for you. There's simply no reason to settle for second best. Life is too short, and you deserve the absolute best possible supplement out there. Even though this is an exclusive formula offered through my site, the price might seem high at first. I really worked exceptionally hard to deliver all the high-potency vitamins and essential minerals you need and keep the price reasonable at the same time. Plus, compare a single bottle of Multivitamin +Plus Vital Minerals to all the different supplements you'd have to purchase separately to get all the ingredients you'll get in this one convenient high-potency product. The cost of all those separate supplements could be more than double your investment in Multivitamin +Plus Vital Minerals! But you really should consider Multivitamin +Plus Vital Minerals part of your healthy food budget, not a separate supplement. After all, I worked closely with the lab to have this formula specifically designed to complement your healthy diet... not to be separated from it. Perhaps there are some processed foods you're buying that you could phase out to help better balance your healthy diet. With Multivitamin +Plus Vital Minerals, I sincerely feel that you're taking an important step in complementing and optimizing your diet, so order yours NOW and start to Take Control of Your Health. Disclaimer #2: The entire contents of the statements and information pertaining to Dr. Mercola Products as well as all video and written articles on this website authored by Dr. Joseph Mercola are based upon the opinions of Dr. Mercola, unless otherwise noted. Individual articles are based upon the opinions of the respective author, who retains copyright as marked. The information on this website is not intended to replace a one-on-one relationship with a qualified health care professional and is not intended as medical advice. It is intended as a sharing of knowledge and information from the research and experience of Dr. Mercola and his community. Dr. Mercola encourages you to make your own health care decisions based upon your research and in partnership with a qualified health care professional. Mercola.com, Dr. Joseph Mercola, or Body Charge Nutrition may have authored the presented information in whole or in part and therefore retain and reserve all copyright respectively.